Crochet Bun Beanie with Faux Cables - Free Pattern and Video Tutorial! 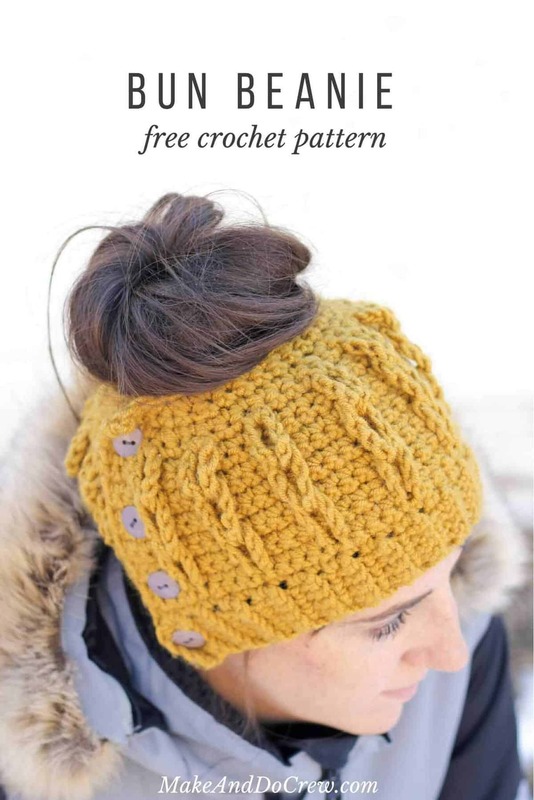 Would you believe this free crochet bun beanie pattern (AKA ponytail hat) uses only single crochet and chain stitches? 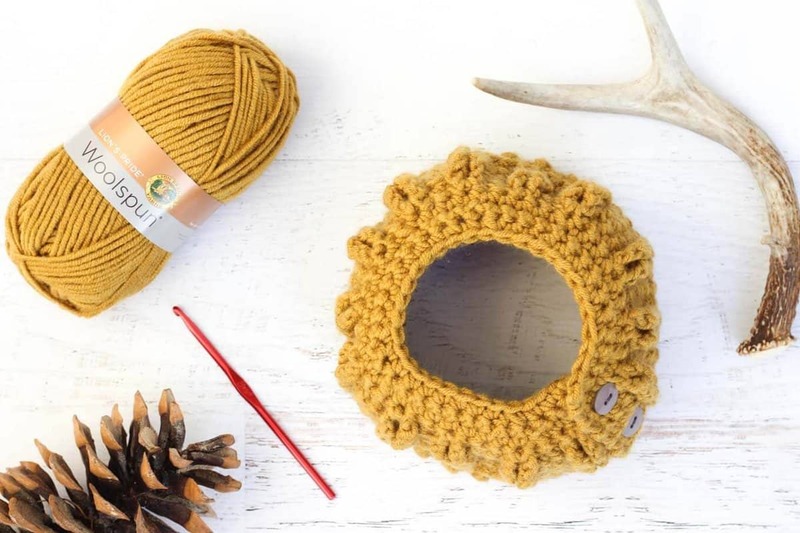 Despite it’s simple construction, the “cabled” look of this beanie is sure to dress up even the messiest of messy buns. As always, the free pattern is below or you can purchase the ad-free, printable PDF for $2.75 here. Oh the crochet bun beanie. Outside of our little pocket of the internet, I’m sure no one has any idea what I’m talking about. But inside this warm, wooly corner of craft blogs and internet crocheters, bun beanies are hot. Hot. Hot. I can see why too. They say, “Hey look, I’m a woman. Yup, see? I have a lot of hair pretty back there. But I don’t care to wash it or style it, so I put this cute hat on and called it a day.” This is my kind of trend. 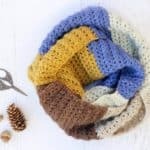 This crochet bun beanie pattern literally requires one skein of Lion Brand Lion’s Pride Woolspun yarn, single crochet, periodic sets of 10 chains to create the loops and some decreases thrown in for good measure. 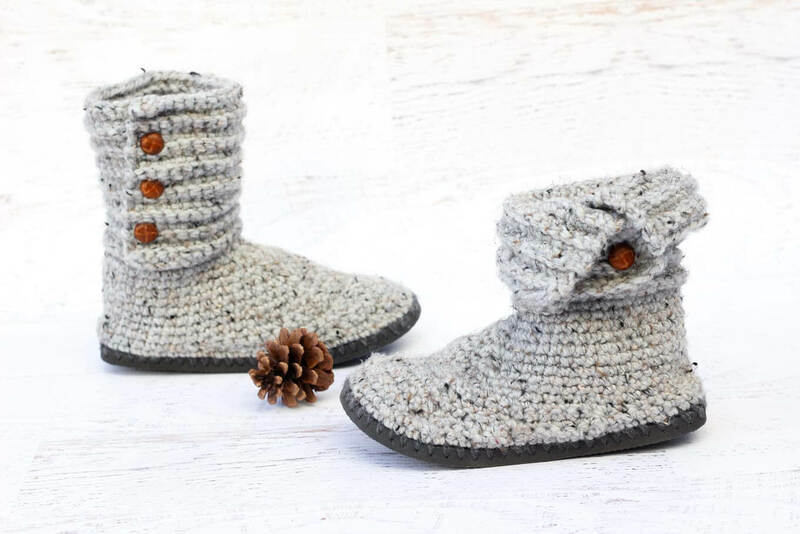 So you can spend more time making beanies and less time shopping, this pattern contains affiliate links at no extra cost to you. 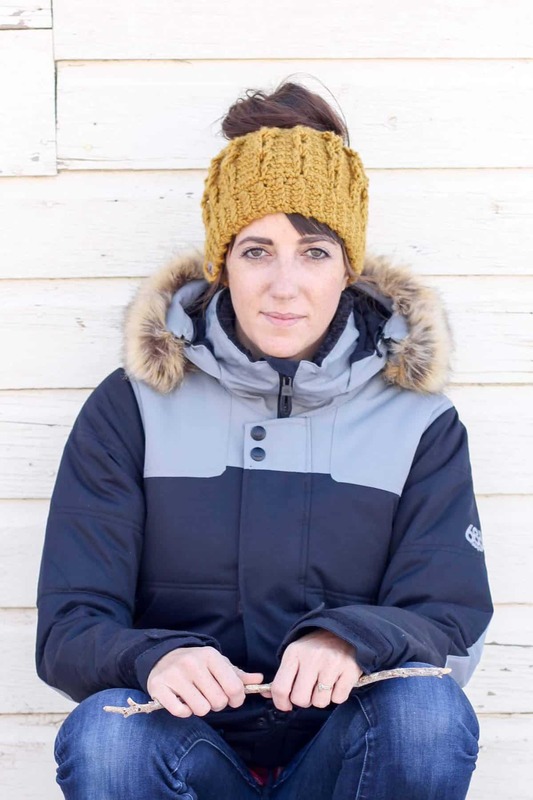 • The ribbing of this beanie is worked first and the hat is built on top. • The entire hat is worked in a rows back and forth and becomes round when buttoned at the end. To begin ribbing, ch 6. Row 2: Ch 1, scblo in each of next 5 sc; turn. Repeat Row 2 until piece measures 23”. 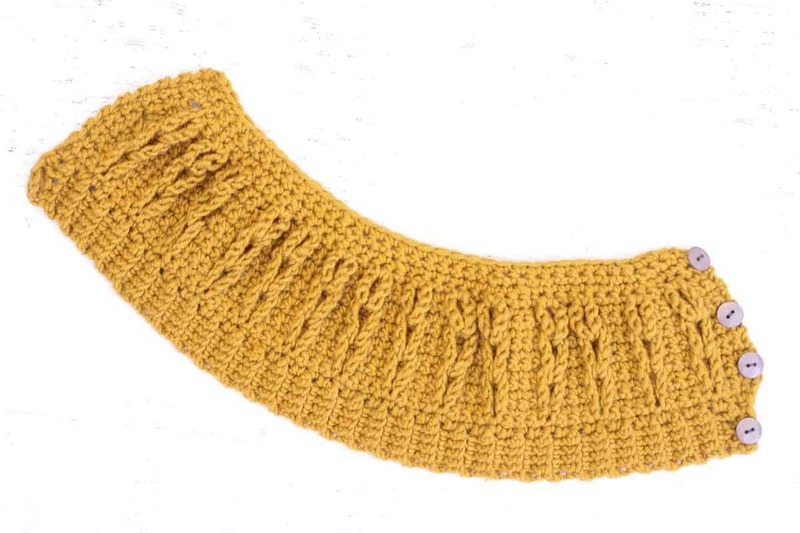 • This pattern is intended to use one entire skein of Lion Brand Woolspun. Since yarn is measured by weight, yardage can vary slightly. If you come up short, simply do not work row 17. • Pull the chain loops from row 1 through the loops of row 5 and pull those loops through the loops of row 9. Reference the video tutorial above for a visual example. • Row 14 picks up row 9 chain loops every few stitches. Just stretch the row 9 chain loop up to see where it should be tacked down on row 14. 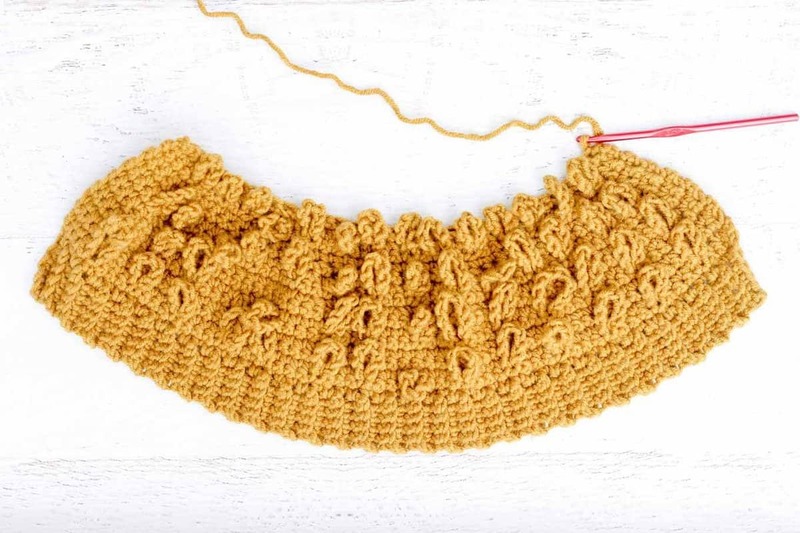 Because of how the decreases are done in row 13, sometimes there will be two single crochet between the chain loops and sometimes there will be three. Sew buttons onto hat to coordinate with buttonhole placement. Weave in any remaining yarn ends. 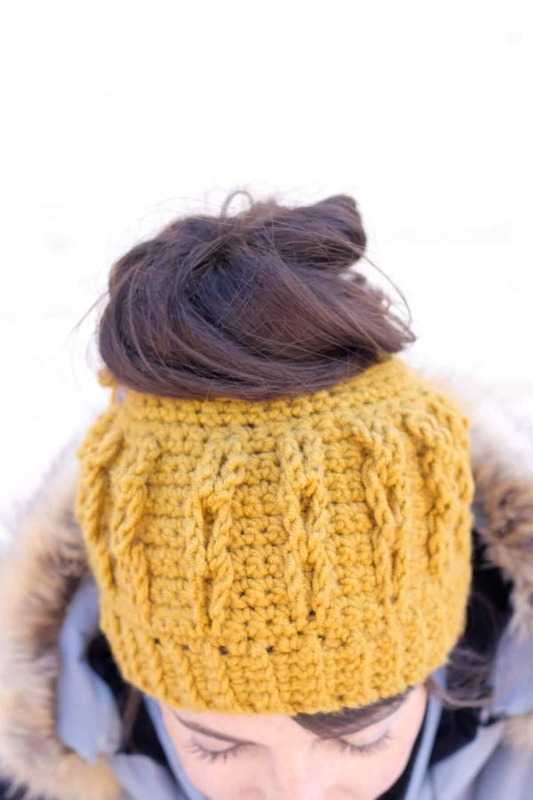 Throw your hair in a bun, pop on your crochet bun beanie and walk out the door—messy hair, don’t care! 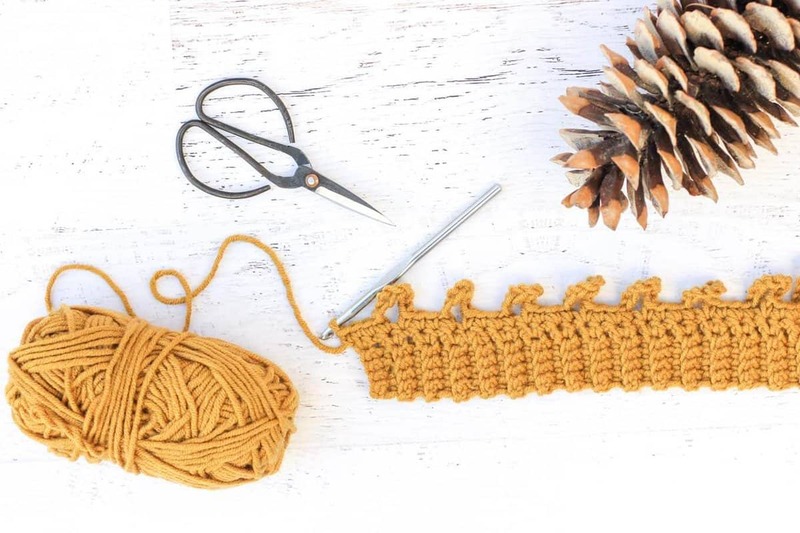 Jess – you have become one of my favourite (if not favourite) crochet blogger and pattern maker in 2016! And this pattern is no exception. Your patterns are so cool and fashionable. Plus you’re super interactive with your readers! I LOVE this hat. I love the colour you chose and the cables and the fact that it buttons so you don’t have to mess up your perfect messy bun! Gosh, Chrisandra, thank you for such gracious feedback. Really. Sometimes I’m just trudging along and hearing from people like you is really a bright spot in my day. I appreciate you being here. 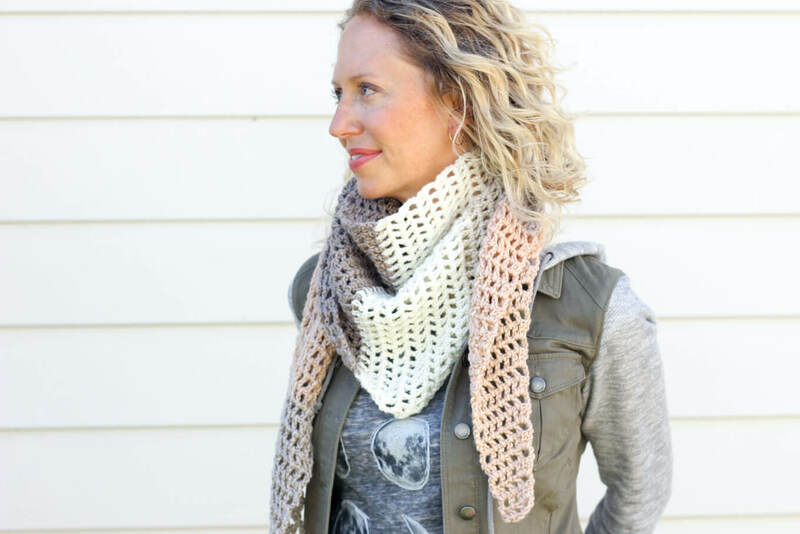 Do you think this pattern would work with a worsted weight yarn? I have a 4 medium on hand. Thank you for sharing your pattern! I haven’t tried it with that, but I do think you could make some adjustments to the pattern and it would work fine. If you scroll through the comments, you’ll see my advice for adjusting the pattern sizing. You might also try holding two pieces of worsted weight together to see if that is a similar gauge to the pattern. Hi. I love the hat! I’m on row two of the beanie and if I complete it my button hole won’t match up on the same side as my first button hole. What did I do wrong! Acknowledge! Thank you so much for the pattern. Yes–you’re totally right. There was an error in the pattern, which I’ve corrected now. Are you using the free pattern in this blog post? It should be all correct now. If you purchased a PDF of the pattern before I caught this error, please email me and I’ll send you the updated version right away. jess (at) makeanddocrew (dot) com. Hi. I love the hat! I’m on row two of the beanie and if I complete it my button hole won’t match up on the same side as my first button hole. What did I do wrong! Ack! Thank you so much for the pattern. I’ve updated it in the pattern. Thanks for being such a go getter and starting this pattern right away so that others can benefit from your proofreading! Thanks for updating the pattern. I’m so excited to see the finished beanie. It means to sc two individual stitches, one per single crochet (so 1 sc in each sc, two times). Does that make sense? The video shows four chain loops made and the pattern makes three in rows 1, 5, and 9 and I end up attaching the chain loops from the back side instead of the front. You win the award for fastest beanie maker! Wow! And for great eagle eyes. The video DOES show four loops. That’s because I shot it all at my house before Christmas, only to decide after the hat was finished that I wanted to adjust it a bit. So I tore it all out and recreated it when I was at my parents’ (away from my video recording set up.) 🙂 The concept it completely the same, there’s just one fewer rows of chain loops in the final pattern. I will put a note about this in the blog post in case anyone else is curious! The intention of the printed pattern is that it’s the same content as the free version, just in an easily printable format. I did realize an error and I have corrected the free and paid versions. I’ve emailed you the new version as well. Hello, VERY excited about starting this!!! Quick question , am I to assume that you start this project with the chainless foundation row? Which part are you referring to, the ribbing or the hat section? Either way, you start the ribbing with a regular old chain 6 and then work the hat on the long edge of the ribbing by making 60 single crochet into the ribbing. Does that make sense? Not sure how I missed the ch 6!!! Thank you! I have not been impressed with the messy bun beanie’s, UNTIL NOW! I love the buttons and not having to pull it over the bun on or off. Thank you for the pattern. Do you sell these? I don’t knit, but I would love to buy one! I would be happy to make you one! I have a small stay at home mommy crochet business. http://Www.facebook.com/simplystitchedbygina. Love love love this messy bun! So fun to do too. Thank you for a great tutorial and all around awesome blog. I’m working on the band. Is the band really supposed to be 24 inches? Does it shrink up as it goes along? 24 inches seems very big. Hi! I’m trying to make this for someone with a 20.5 inch circumference head. Can you help with amendments to the pattern both ribbing and main body? Thank you! Super excited! I just responded to another comment on how to make it bigger, so reading that might be helpful to you. Essentially the pattern repeats in multiples of 4, so I’d make a 21.5″ ribbing (to accommodate for the button overlap) and then work a multiple of 4 stitches into the ribbing for the first row of the hat. Right now it calls for 60 sc, so you might do something like 56 or 52. Hope that’s helpful! Thank you so much! Your attention/replies to the comments is amazing and so appreciated. Love this and want to make it. Have you tried any other substituted yarn yourself and if so what? Also the video won’t play and it’s not on youtube. Please help. Keep up the awesome job! I’m so sorry about the videos! Booo! I’ve been troubleshooting the heck out of this with my ad company. Will you please let me know if you’re still having trouble playing it? I apologize for the inconvenience. I haven’t tried substituting yarn, but I did just write an explanation of how to adjust the pattern for a lighter weight yarn in a previous comment. Take a look at that if you think it might be helpful! I worked this up yesterday, after a trip to the dentist and, and with a new movie on. But, unfortunately, it is a child size. But so very cute! I used a colorful yarn that changed colors for each loop. And I used a lighter weight yarn. (that is where I made my mistake) So I am going to try again with less reductions going toward the “bun” and see if I can change the pattern for the weight of the yarn so it will fit a big head. Maybe another row up too. I want to put it on my website anyway. This is a great pattern! How to I link to you so you get credit for this awesome pattern? I’d love for you to link directly to this pattern page. Thank you! I do not know how to send you a copy of the one I finished (for a child… by mistake) but I am linking to you and uploading the pictures to my web site today. Thanks for update on how to go larger in multiples of 4 – how simple is that! I was going to try and wade into crochet abyss winging it! Thanks for helping a beginner get more out of my yarny attempts. Lol, Debi, winging it in the crochet abyss is my forever state! 😉 I’m glad you were able to figure out my instructions! I just saw your hat on your website. It’s gorgeous! Those colors are so pretty. Whoever buys will will really enjoy it I’m sure! I made another one today with a variegated blue that changed colors through the loops – looks awesome. I ended up going up to 82 sc along the ribbing and it worked finally. I had to tear out the last 3rows and not sctog as many times. Did I write it down so I don’t have to tear out again on the next one? Nope! 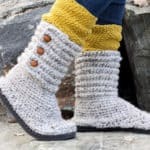 I’m hooked on this pattern and I might just give the bulky yarn a go on the next one. Thanks for your creative pattern I’ve had a great time with it! I posted your link to FB too! Thanks so much for sharing my pattern on FB, Debi! I’m really happy that you’ve had luck adjusting the pattern to suite your yarn stash! I can’t tell you how many times I’ve experimented with some crochet pattern and then not written down what I did. I just get so caught up in the heat of making things, I don’t want to be slowed down. I bet you’ll figure it out again easily! I’ve made 2 of these measuring row 2 at what you have specified, and neither have fit my head….would you suggest just making it longer?? I’m just learning how to crochet. Hmm. You could do one of two things. Probably the easiest is just to use a bigger hook and see if that gets you closer to the size you need. Otherwise, you can make the ribbing about an inch longer and add about 4 stitches to your first row of sc along the ribbing. (So you’d have 64 sc instead of 60). Then you could just work the pattern as is, but know you’ll have one extra set of chain loops. Does that make sense? Thank you for this amazing pattern. It’s so cute and I love that it wont mess up my messy bun more! I don’t have any chunky yarn so can I use two strings of worsted weight together to achieve the same chunkiness? I’m a total newbie (more or less). Thanks!! Hi, the pattern calls for 60 sc around the ribbing; I have about 71 chains . Did I do something wrong? The ribbing measures 23″. Do I skip over to make the 60 or not. Sorry, I’m lost. It’s such a beautiful beanie and I’m so excited to make it. I appreciate your help! That first row of sc is worked directly into the long edge of the ribbing. So you’ll want to spread your 60 sc evenly across that long edge and then the hat will be crocheted up toward the top of the head from there. Does that make sense? I’ve matched up through row 1 of the beanie. On row 2 my button hole matched up but I counted single crochets and at 60 i still room at the end to crochet. Any tips?? Do you mean that you still have room at the end of the ribbing? Like a little section of ribbing is hanging off? I was able to figure out my mistake and finish the project. It came out smaller than I wanted because when I went from the ribbing to the sc 60 I had extra ribbing after crocheting the 60. I went back and decreased the length of the ribbing instead of spacing the 60 sc out more. Definitely a tip when going from the ribbing to beanie would be helpful. I folded the ribbing in half and set a marker. then I worked the 30 for 1/2 evenly spaced in and then did the same thing with the other half. Thanks for sharing your helpful advice, Lois! 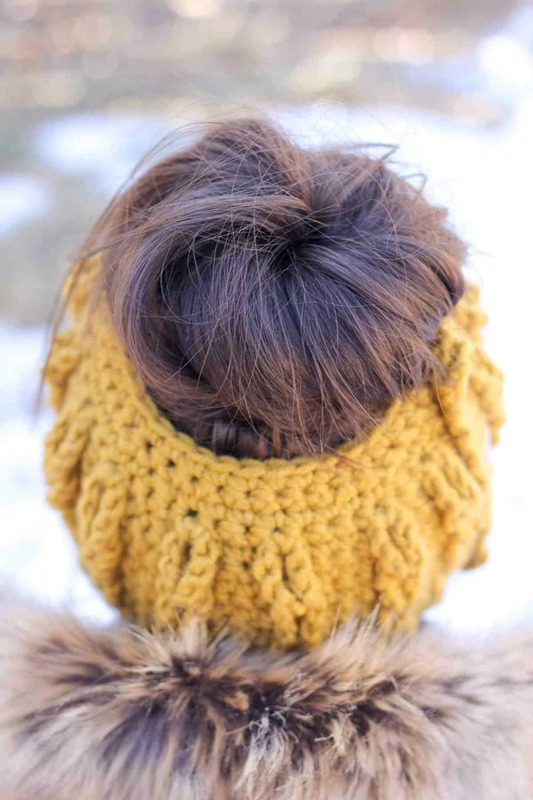 Love this bun beanie! 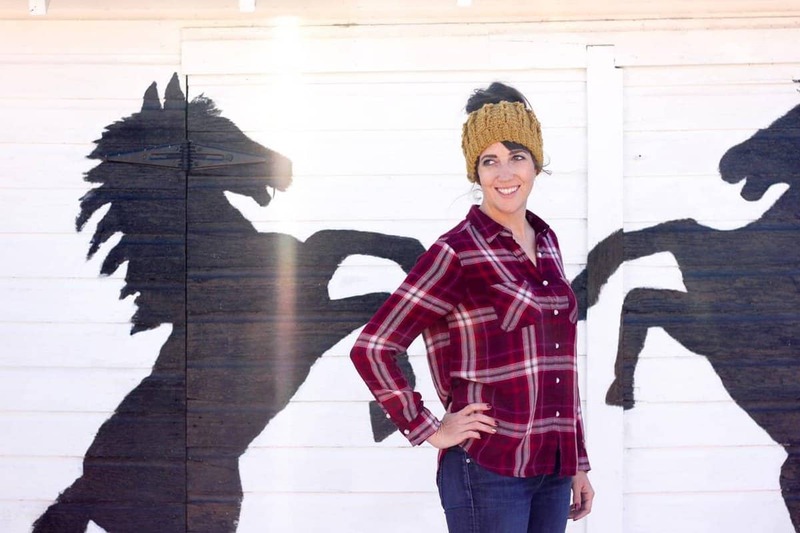 It’s perfect for those of us who have massive amounts of thick hair that make it impossible to wear regular winter hats! 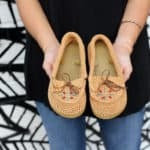 Such a fun, creative idea! Great hat pattern and I’m working on it now.If I want to make it smaller for a 20.5 inch circumference head, do you have recommendations on how long to make ribbed brim section? Also, how many sc stitches should I start with instead of the 60. Thank you!! I just replied to your other comment above. Let me know if you have any other questions! Hi there, the ribbing, you make a button hole, make rows until 23″, then another button hole?? On the ribbing?? You just work the ribbing with no button hole for 23″ and then make one button hole once your ribbing is 23″ long. So you’ll end up with one button hole on the ribbing and three more as you work up the hat. I’m just wondering if anyone has worked with a yarn other than the one listed. I’ve been on to yarn sub for the other types I could use, but a lot are not available in stores around me. Just wondering, as I’ve made one for someone already and it turned out to be too small for her head and in order to make a larger one it would cost over 16 $ (CAD) just for a skein and a bit to complete it for her head (she has super thick hair making her head a bit larger). If any one could let me know that would be great! Hmm. Let’s see. 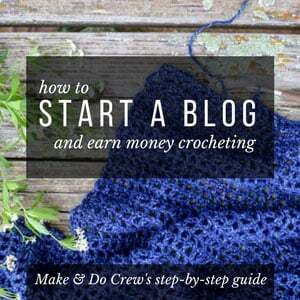 I know one reader was going to try to make the hat with two strands of worsted weight yarn held together. That might be a good option to at least swatch up and see what you think. 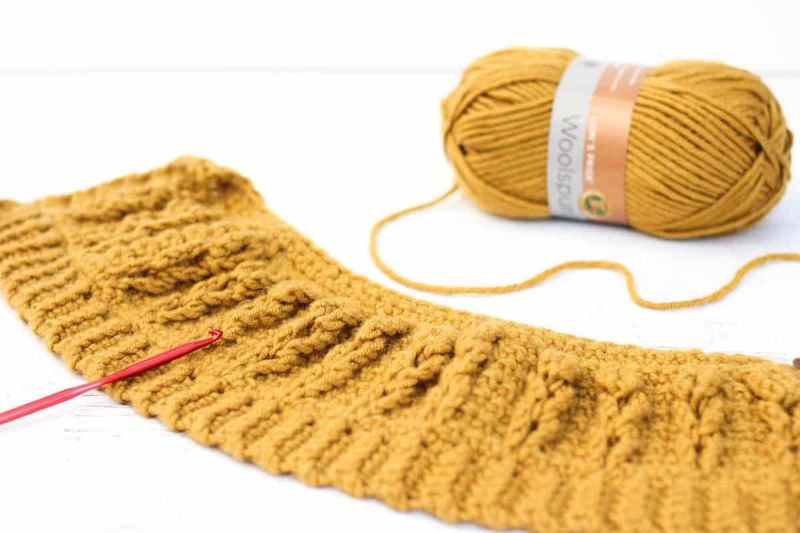 If you look back in the previous comments, I’ve described a few ways to amend the pattern sizing if the double strand combo ends up creating a little bigger gauge. If you do find a good alternative, I’d love to know what you use so that other readers can have it as an option. Thanks Jess! I’m going to see if I can track down something that looks and feels similar when I go back to the store to pick up my second skein of lion’s pride for my current hat. I will let you know what brand etc. once I tackle it. Love the pattern! Made my third bun hat and this one was the one I used a different yarn for. I used Bernat Softer Chunky which is a 6 – super bulky. I made the ribbing thicker like my last one and did everything else the same as the pattern, it turned out stiff so I washed it and now it is just as great as my ones made with p Woolspun only heavier for those really cold winter nights! When I am doing the 60 single crochets, for some reason I have only 30. What did I do wrong? Was I supposed to single crochet into more of the ribbing? I have no idea!! Hmm. Well, first you work the 23″ of ribbing, then you sc along one of the long edges of the ribbing to create a total of 60 sc stitches (along that long edge). Those stitches are the foundation that the upper part of the hat is built on. Does that make sense? Is this worsted weight yarn? It’s a little thicker than worsted weight. If you check out YarnSub.com, you can see other yarns that are similar in weight. I know I must be reading something wrong. I have made the first row in the beanie with the loops. Row 2 wants me to make the button hole. This is at the opposite end from where my button hole is in the band. What have I done wrong? I’m sorry it’s taken me a while to write back. Have you gotten your button hole figured out? I’m wondering perhaps you missed the row after the ribbing called “foundation row”? I just noticed that it wasn’t bolded, which might have made it easy to miss. I’m so sorry if that was the case. The first button hole should be at the end of your ribbing, then you work the foundation row down to the other end, then row 1 back to the button hole side. Then when you work the button hole at the beginning of row 2, you should be in the right spot. What do you mean? There are not enough stitches before the “cable” area? I’m happy to try help if you’d like to give me a little more info. like the beanie but not happy with the written instructions. I’m sorry to hear that. Is there something I can help clarify for you? On row 10 am I suppose to do 2 rows like 3-4? I have never seen this type of pattern before. I love it. I think it would also look great as a scarf! Absolutely love it! The cables give it great style and the buttons do too. It is quite unique, I’ve seen tons of bun beanies, but this is the first buttoned-up one. Great idea. I pinned it for my followers. Thanks for sharing. Others get a better result. I’m currently working on this pattern and am on row 10 and already running out of yarn! I’m using lions pride woolspun 127 yd like suggested. And have even skimped out on the band … which measures 21″ instead of 23″ … What am I doing wrong?